Fair View Bed & Breakfast have been awarded a Certificate of Excellence for 2018! Congratulations from all in the MBF for this wonderful achievement. when we will advertise the sponsors, buying more bulbs to plant in open spaces and for another project next year such as the School Project. Can we also thank the Business Forum for distributing our leaflet with the new Business Directory. We have been asked to circulate the news that the Neighbourhood Plan is now complete and encourage everyone to consult it. The full plan is available at the Parish Council Offices at the Memorial Hall, the Library, the Medical Centre and various other venues in the village. There are two Consultation Open sessions on 13th July between 6pm and 8pm and Saturday 14th July between 9am and 12noon in the John Banks Hall at Marden Memorial Hall. 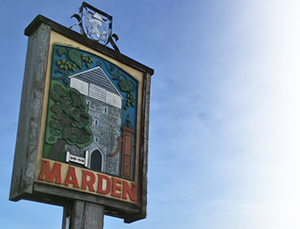 The Steering Group would be grateful to receive your views to ensure the plan represents the best interests of Marden. The MBF have received this letter, from a resident in Lime Tree Close, can any Member enlighten us? During the last three years we have lived here, about this time of year, just when you can have the windows fully open, someone/company burns something that smells like plastic. This is always done around 2am and lasts for a couple of hours. Difficult to point a finger at anyone but it would seem reasonable to suppose that it is coming from the industrial area in Pattenden Lane. Could I ask you to contact your members and either try to establish who is doing this or at least make them aware of the environmental effects this has? Hello, My name is Kasha and I am the new Manager of Marden Children Centre at Goudhurst Road. We are planning an event for our families, targeting those who are in need of support. The event will take place on the 8th of August 2018 from 11-1pm at the Cockpit area. Is there any one in the forum that undertakes cleaning services? On behalf of the Marden Cricket, Hockey and Tennis Club I have been tasked with getting contractors to clean the temporary facilities and showers etc, this will expand into the weekly cleaning of the proposed new building when it is finished. All articles must be emailed to newsletter@mardenbusinessforum.com before 12 noon on Thursday 2nd August to be included in the August newsletter.